Cutting Social Security benefits is bad policy and bad politics. 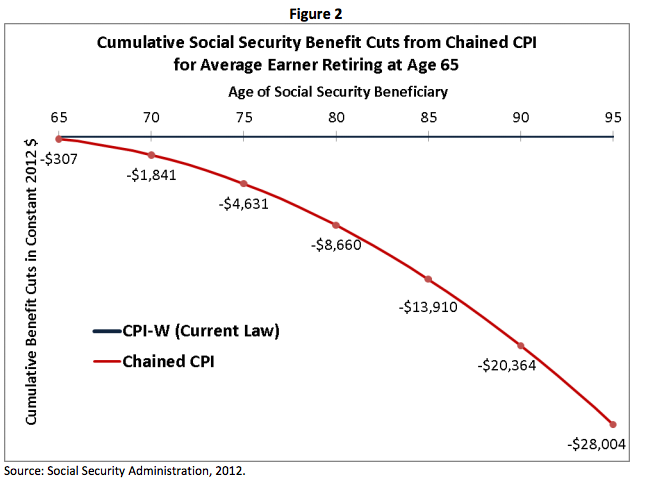 The president's budget proposal includes the expected Chained-CPI cut. (AP Photo/Manuel Balce Ceneta). President Obama released his proposed 2014 budget Wednesday morning, and it included a hugely controversial provision: a switch to a Chained-CPI formula for calculating inflation. Many different government programs—most notably Social Security—calculate benefits based on the rate of inflation, so that benefits don’t lag behind an increased cost of living. The IRS uses similar formulas to ensure that people aren’t pushed into a higher bracket simply because of inflation. Current formulas might, for example, rate an increase in the price of beef as inflation, but not consider the fact that people might start buying chicken instead. Chained CPI aims to control for the choices people make in the face of rising prices, and so the inflation it calculates naturally rises more slowly. Generally this means fewer benefits would be paid out, and people would be pushed into higher tax brackets more quickly—and both result in more money for the government, and thus more deficit reduction. The White House estimates this approach would save $230 billion over ten years. Seems sensible: but there are a lot of hidden dangers, both on policy and politics, and the White House and its defenders aren’t always forthright about them. 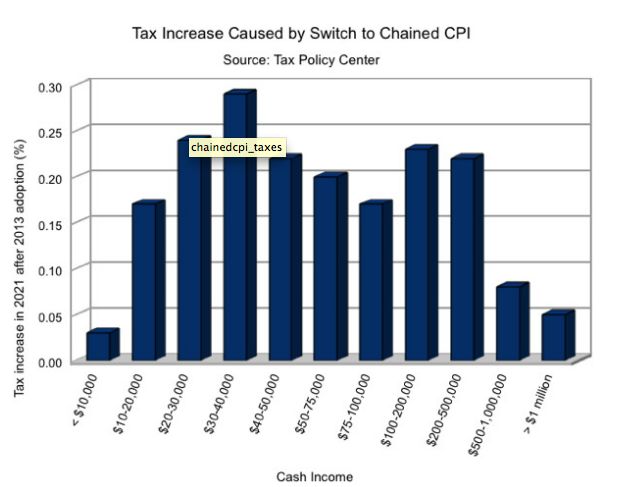 Here are the top five myths about Chained-CPI. We’ll get to the accuracy argument next, but there’s no debating these simple points: Chained-CPI is both a benefit cut and a tax increase. Proponents of Chained-CPI rebut the benefit cuts by making an accuracy argument—suggesting that beneficiaries are getting an unfair windfall from current inflation formulas that are over-compensating for inflation. There’s no doubt that, economy-wide, Chained-CPI is a more accurate measure of growth in living standards. But that just doesn’t hold when applied to seniors on Social Security. In short, the 65-and-older households spend roughly three times what the rest of the population does on health care, measured as a share of total spending. Further, between 1989 and 2007,prices for health care have risen nearly twice as fast as overall inflation—growing 100% over that timespan, compared with 53% growth in overall prices of consumption goods. Seniors spend a lot of money on health care, and just aren’t able to buy different, cheaper drugs when the price of their medication goes up—so the Chained CPI argument just doesn’t work here. And the price of those drugs is going up much faster than the prices of most consumer goods, and the same is true of Medicare premiums. EPI concludes that “In short, rising health care costs and falling incomes already provide large pressures on Social Security beneficiaries’ incomes as they age. 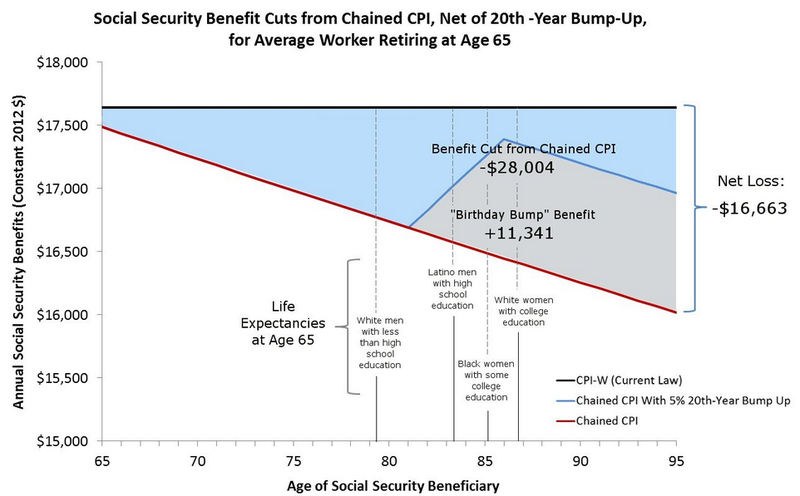 Reducing the [cost-of-living] adjustment would just apply one more economic pressure that grows over their retirement.” They advocate switching not to Chained-CPI-U, but CPI-E, which measures cost-of-living increases among the senior population. Note, too, that these seniors are the ones bearing most of the brunt from switching to Chained-CPI government-wide: about $115 billion of the $230 billion in estimated savings comes from Social Security. The administration proposes the aforementioned “birthday bump,” which as we noted still doesn’t make up for the benefit cut. They also advocate protecting lowest-income seniors and people with disabilities by exempting Supplemental Security Income from Chained-CPI. But here’s the problem: SSI is already too small, and doesn’t reach enough poverty-stricken seniors. In fact, there are 9.4 million poor or near-poor people who receive Social Security, but not SSI—so they still get hit. In addition, there are 2.8 million “dual-eligibles”—people who are on SSI but also receive some Social Security benefits. They’d be hit as well. While the administration laudably wants to protect various veteran’s benefits programs from Chained-CPI, 9.3 million veterans are on Social Security, which is one in five Social Security beneficiaries. So they still won’t be totally insulated from the Chained-CPI cuts either. Obama argues that Chained-CPI isn’t what he wants, but what he feels he must to do get a deal with the GOP. “I don’t believe that all these ideas are optimal, but I’m willing to accept them as part of a compromise,” Obama said in the Rose Garden Wednesday. But he proposed Chained-CPI during the debt-ceiling talks in 2011, and the GOP did not accept his grand bargain. He proposed them as part of a deal to avert the sequester earlier this year, and the GOP did not accept the deal. Now he’s proposing them in his budget. Is the result any different? Well, no. Paul Ryan rejected the idea that Chained-CPI would make a deal with Obama viable. “I don’t see this as fundamental entitlement reform as much as clarifying a statistic which does happen to save money,” he said Wednesday. No Republicans in the House or Senate have yet said they were interested in Obama’s budget, and the prospect of them doing so is non-existent. In fact, Obama may be unintentionally strengthening the Republican’s hand in this debate by validating their theory of deficit reduction. Instead of battling the GOP on the idea that cutting the safety net is a bad way to reduce deficits—particularly Social Security, which doesn’t even contribute to it—Obama has endorsed the GOP approach by agreeing to Chained CPI. And don’t think they won’t point that out—and use it to advance the ball on cutting entitlements. Think of this phase of the sequestration and budget fight as an election—where each side tries to convince the public that their approach is optimal. Winning means the other side is under the gun of public opinion and comes to the table ready to deal. Endorsing the other side’s ideas during this phase is not terrific strategy. 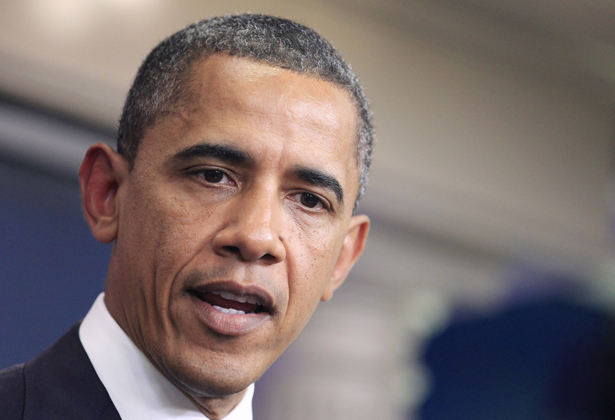 Might Obama have to accept some Republican ideas in the final agreement? Sure, but the GOP has shown absolutely zero desire to reach an agreement, so prematurely endorsing their approach is explicitly counter-productive. Defenders of the White House strategy theorize this approach is helpful for public opinion because it highlights that the GOP is unwilling to compromise. A key argument against Chained-CPI that progressives have made for months is that Republicans would use it to slam Democrats in the 2014 midterms, just as they did with the Medicare cuts in Obamacare. The White House pushback is twofold. First, point out this isn’t what Obama really wants. “This is a Republican proposal,” White House press secretary Jay Carney said on Thursday. Actually, it’s in Obama’s budget, so good luck with that defense. Meanwhile, senior White House officials ultimately think this line of attack won’t be effective in 2014. “The White House…feels it can win any political fight on entitlements…after the successful test case of the 2012 campaign, when Republicans tried to make an issue of the $700 billion in Medicare savings contained in Obamacare, but didn’t land any body blows,” Alex Seitz-Wald reported after a briefing from administration officials. Two, one can’t take an extremely reductive approach to the 2012 election: just because Obama won, every attack Romney and Ryan wasn't per se ineffective. The ferocity and frequency with which they attacked the $700 billion in cuts suggests they had data showing it was costing Obama votes. Just because it didn’t cost him enough votes doesn’t mean it’s a bad strategy. The AARP reveals that 70 percent of voters age 50-plus oppose the use of the chained CPI to cut benefits, and two-thirds of them – including 60 percent of Republicans — say they would be “considerably less likely” to support a congressional candidate if he or she backed a new way of calculating consumer prices. And 84 percent of voters over 50 say Social Security has no place in budget-deficit discussions, since it is self-financed. George Zornick last wrote about another new proposal in Washington that has left much of the country disappointed: the gun control package.